Here are the blocks I made for Melissa for the Modern Quilting Bee. She asked for Wonky Log Cabin blocks, and she is going to call the quilt, “What a Girl Wants.” Look how cute those fabrics she sent are! I can’t get over the lipstick and high heel shoes! And I had to add a donut and sugar packets! Oh, Heather Ross….how we love you! I added a couple of my own fabrics to the blocks. For the block on the left, I added the orange Fleur Des Lis pattern (Heather Bailey, I think). I also added the small polka dot in the center. 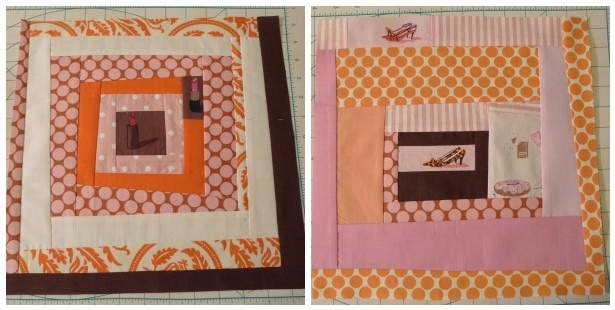 For the block on the right, I added the pink striped fabric. I loved making these, Melissa! so cute!! especially the sugar packet!